Forming well-defined systems from a chaotic starting point is common practice in biological systems. Especially on the extremely tiny molecular or atomic length scales, nature is a true self-assembling master. Examples of these facinating structures are ice crystals from individual water molecules, virusses from proteins and genetic material and cell membranes from soap-like fatty molecules. The formation of all these structures is a spontaneous process. That is why on these length scales we speak of self-assembly. This is in contrast to for example a box of Lego®. Despite that all the building blocks are inside the box, the cool car or truck will never build itself. Therefore we refer to these macroscopic processes as assembly. How do structruces from by itself? The huge size difference between molecular or atomic and the Lego® building blocks makes the physics of these systems completely different. In contrast to Lego® bricks, molecules or atoms are constantly moving. 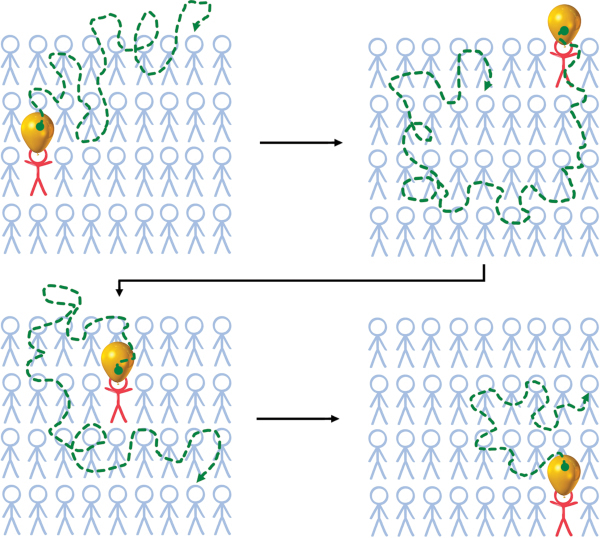 These movements, referred to as Brownian motion, can be compared to a large balloon floating over a crowd of people. Everytime the balloon lands on a person (red stick figure), it gets kicked up and it starts a random path (green arrow) until it lands on the next person. If this process continues long enough, the balloon eventually samples all available space. If this process happens with a collection of building blocks, they will eventually meet each other and start to stick together to form assemblies in a spontaneous fashion. The building blocks and partially formed structures keep on moving around until the assembly is complete. 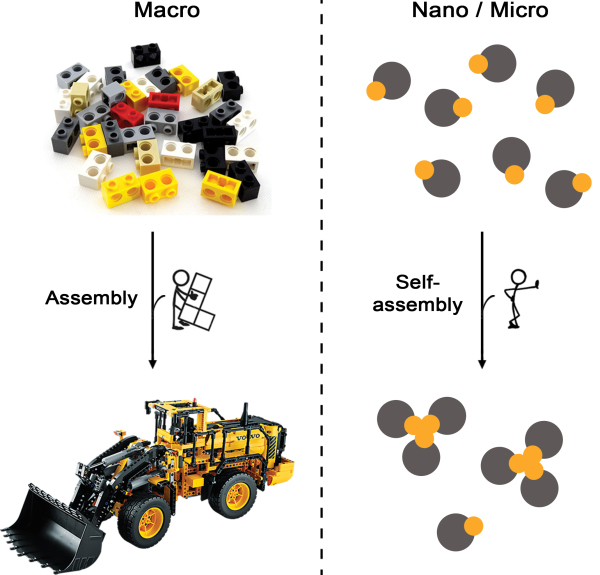 How do we study self-assembly? ​ Studying atomic of molecular systems directly is very challenging since they are extremely small. Molecules are typically not larger than 1 nanometer (= 0.000000001 meter = 0.00000004 inch). 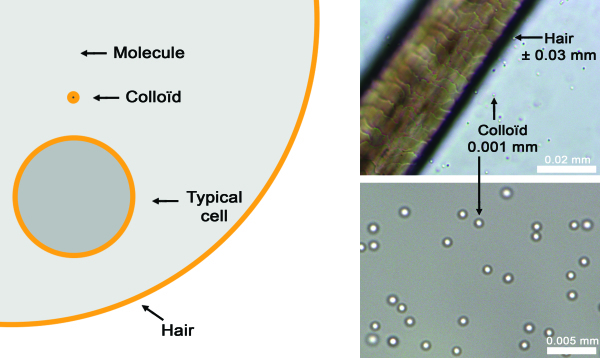 To put this in prespective: a human cell is roughly 10000 times larger and a hair is 50000 times as thick! Even with the most fancy microscopes, direct visualization of atoms and molecules is extremely difficult. To circumvent this, we can play a little trick and use so-called colloids. These are particles with sizes of 10 to 1000 nanometer and have therefore dimensions in between those of molecules and our Lego® bricks. Because of this intermediate size colloids offer the best of both worlds: we can easily see them with a microscope AND they constantly move in a similar fashion as molecules and atoms do. Most commonly used colloidal systems are made of silica (sand), polymers (plastic) or metals like gold and silver. The particles typically swim around in a sea of dispersing fluid.